Why hello there blog. I haven’t seen or written on you for a while now. How about we start our on and off relationship again? Good for you? Yes, good for me too. So what have you missed? I haven’t joined any serious road races lately. Awww…don’t pout…I am still active in a lot more things now. I swim, bike and run. I know you’re thinking yeah right – I’ve heard it all before – your first try at tri was a fluke. I am writing to you today to tell you that I am truly serious. I joined the bandwagon and signed up for Cobra IM70.3. No, i’m not crazy. Well maybe a little bit. You see, well you probably don’t but most likely you know that I can easily be persuaded. So that’s what happened to me – I got suckered into signing up for my dream Triathlon event. Well, if I’m going to do it, might as well as sign up hubby also. Now, now don’t sound surprised. I frequently do this to Noy. Let’s see – Condura 21k, TBR Dream Marathon, T2N Ultramarathon and the list goes on and on so relax. Do not give me that look. It’s too late. Besides, I made it up by buying him a spanking new bike with matching tri shoes plus new tri gear. Plus I know that he can do it. He’s a swimmer, he can bike and I know you doubt it but I assure you – he can run. So enough of him. Let’s now focus on my favorite topic – me. What have I been up to lately, you say? Well, I ditched drinking beer and moved to whiskey and single malt, been craving for dayap cake from Chocolate kiss…oh so good. What’s what? Oh you don’t care about what I drink and eat and want to hear about my sport? Oh how limiting… Fine. Well…I can now swim with horrible, horrible form. I now own a road bike and I am absolutely thrilled to be able to ride it every chance I get. Still don’t own a pair of tri or road shoes but one is on the way. Need to practice wearing cleats. And of course, I still manage to run – a bit. To show you how serious I am in my new found sport – I am happy to share that I joined a triathlon team. 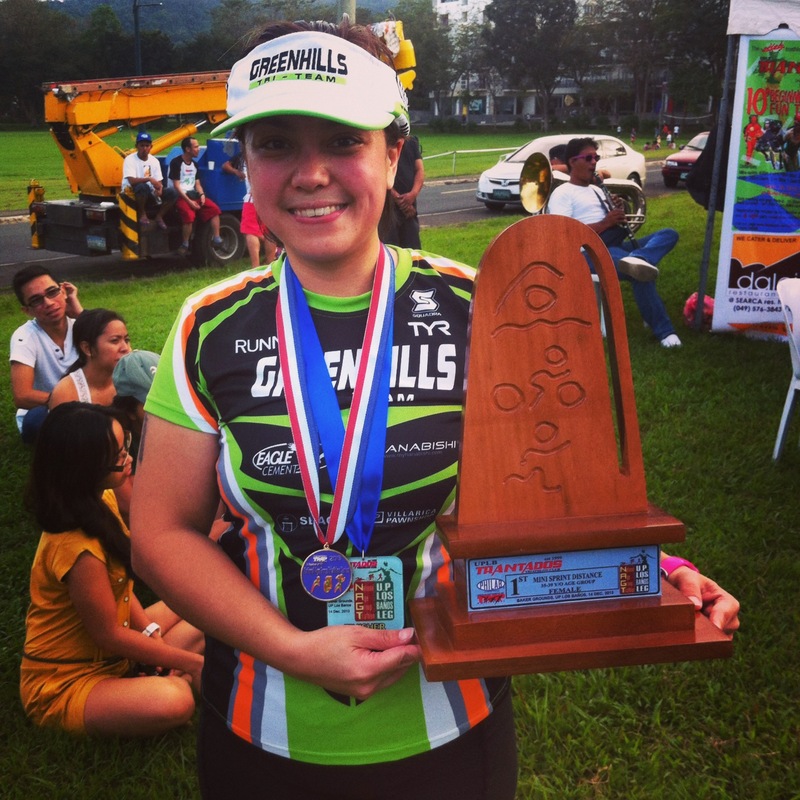 I am now a member of the Greenhills Tri Team. Of course I again dragged hubby along. That’s the story of his life I tell ya. I also survived my first mini sprint Triathlon. Yay! Struggled during the swim. Push myself in the bike segment which I regretted when my legs gave way when I dismounted and almost fell! And I just ran during the run segment. I didn’t stop and just ran. I even motivated this lady who I saw was walking. I told her to just keep on running not to stop. Felt kinda good about that. Ended it the race with a bang. First place in my age category. The UPLB NAGT was quite an experience but it made me doubt my swimming skills. Sure I can swim straight for 1k. Sure I know how to tread, breast stroke is a different thing. But my golly wow – I was not prepared for mass swim start. All I could see were bubbles. Lots of ’em. I kept on hitting the rope. I kept on losing my breath. And worse – I drank so much water! Sigh…. The effect on me was enormous. A few days after the race, I tried swimming in MASA and I could barely make 500m. What a problem. A mental problem. Last weekend, we spent the end of 2013 at the beach. We needed to test our skills in open water so hubby and I picked two buoys about 150m away from each other and decided to go around each of them five times. It was scary. Again, I got disoriented and found myself swimming away from the buoy. Oh boy. Gigantic problem. I have 7 months to improve. Panic mode on. I am now in the process of looking for a swim coach, a program manager/tri coach. Ige Lopez is the man for the job. Still looking at a swim coach. I would probably have to go with Coach Titus for the run. As I told my hubby – This is it pancit! To which he replied – Sure thing pating! Oh no….sharks….